Can crushers are onsite in Tayto Park and Trim Castle as roving can crushers, which will be stationed at various public areas in Trim, including schools and the library. The can crushers allow cans to be separately recycled on site, wherever they are situated and are a novel way to engage the public in recycling. Once crushed each crusher has capacity for 2,000 cans – 20 bin bags and the material recovered is much cleaner than that in our on street bins. If cans are clean from contamination they are easier to sort for recycling and can crushers makes this simple. Trim Tidy Towns are currently collecting cans, throughout the year as part of Every Can Counts and recycling them through Panda Waste recycling division IPR. We would like to see many more Tidy Towns groups taking a similar initiative around Meath and making use of this valuable resource for the community. Remember cans have a value and can be traded for cash. 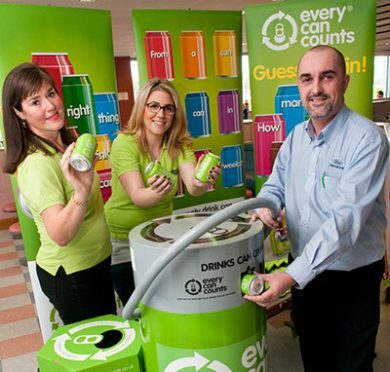 Every Can Counts received Agenda 21 funding to provide can crushers in Meath and Dún Laoghaire Rathdown County Councils, this is a wonderful resource for separated can recycling, in these areas. Dún Laoghaire Rathdown County Council have supported community and educational facilities by supplying can crushers, St. Andrew’s College being the most recent beneficiary, with Shankill TT and IADT signed up to receive their can crushers to complement their individual waste management projects. If your Tidy Towns group or school or indeed company would like to get involved in separating cans for recycling and perhaps donating the proceeds of your cans locally, please get in touch with Every Can Counts or your local authority Environmental Awareness Officer.